Choosing a dog breed that is hypoallergenic be an intimidating process. What if I make a wrong choice? When someone in the household suffers from allergies, especially if it’s one of the kids, the process can be downright daunting. As long as you choose the right breed, you can enjoy the company of our furry friends, as long as you take certain precautions. Roughly 10% of the population in the United States has a pet allergy (Source). And yet, there are over 78 million pet dogs in the country! According to the most recent statistics from the ASPCA, 44% of households in the USA have a dog, and they are the most popular pets worldwide! For families who have children with dog allergies, the choice whether or not to get a puppy, and then which breed to get, can be very difficult. But if your family has their heart set on adding a pup to the family, there are plenty of ways to combat allergies and enjoy life with a dog. Did you know? Your pet can be allergic just like we can, especially to commercial food. Here are our hypoallergic dog food recommendations so you can prevent before it happens. Contrary to popular belief, there is no one breed that that is entirely hypoallergenic. This is mostly because human beings are not allergic to the dog’s fur, but rather the dander that flakes off their skin when they shed, as well as their saliva and skin secretions. Some breeds are better suited to allergy sufferers than others, mostly due to the texture of their fur, the amount that they shed (or, in this case, don’t shed) and the layers of coat that they have. The best ones are “low shedders”-the less fur that the dog sheds, the less dander will be floating around the home. While it’s important to remember that kids who suffer from severe dog allergies may never be able to live with them comfortably, some breeds are more tolerable for those who suffer from allergies than others. Let’s explore the best hypoallergenic dog breeds for allergy sufferers. It’s not surprising that first on our list is the American Hairless Terrier. As their name implies, are completely bald! While they require a little extra care (they are sensitive to hot and cold temperatures, and their skin needs sunscreen when out and about), these little dogs make an excellent choice for allergy sufferers. Since they have no fur and don’t shed, they are less likely to induce an allergic reaction. This popular and friendly breed has a tightly coiled and almost wooly coat. Since they don’t shed, they make an excellent choice for families with kids that are allergic to dogs. The Bichon Frise’ no-shedding coat means that their fur grows continuously, so they need to be properly groomed at least once a month to keep them clean, happy and healthy. And as a bonus, Bichon Frise are known for being especially loving with kids! Because Poodles can weigh as little as 5 pounds and as much as 80, they can fit into nearly any family! All varieties of Poodle (teacup, toy, miniature, and standard) shed very little. So whether you are looking for a tiny friend for your family or an athletic water dog, rest assured that all Poodles are relatively safe. Because they don’t shed, Poodles need to be groomed (and shaved!) rather frequently. If their coats are not regularly maintained, their coats can get matted and will collect dust and other allergens. This breed looks similar to Poodles and is another excellent choice for anyone with allergies. Initially bred to hunt waterfowl in Spain, these friendly and active dogs have a tightly curled and waterproof coat, which means they shed very little and make a great choice. Like most breeds, Spanish Water Dogs require regular grooming, and many owners choose to shave their hair short to reduce allergens and keep them cool during the warmer months. Often hailed as the perfect dog for those who have children who suffer from allergies, Goldendoodles aren’t always hypoallergenic! Because Goldendoodles are technically a hybrid breed (a mix between a Golden Retriever and a Standard Poodle), some puppies in the same litter may take after the Poodle, while others may resemble Golden Retrievers. They are a very friendly and popular breed and for a good reason! 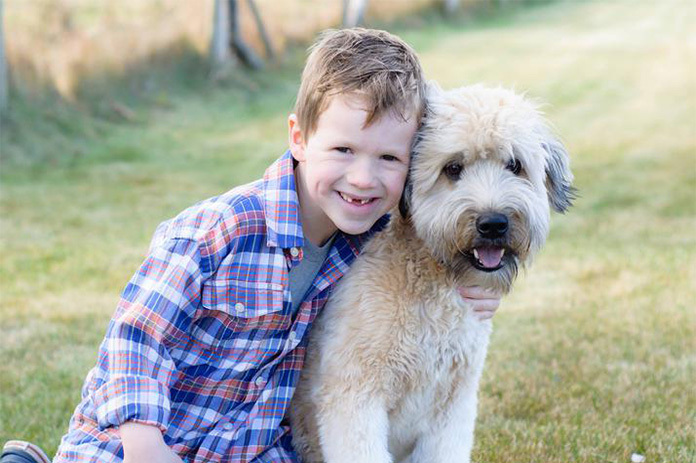 Goldendoodles are very good with kids, extremely intelligent, and known for their loving personalities. However, Golden Retrievers (unlike Poodles) are not a good choice for children who are allergic to dogs. When choosing a Goldendoodle puppy, it’s important to choose one that has the classic curly Poodle fur. Even then, there are no guarantees! Consult with the breeder when choosing a Goldendoodle puppy, as they may be able to tell better which puppies from the litter are more likely to grow up to have the Poodle’s low shed coat. All in all, Goldendoodles are one of the best choices for families looking for a hypoallergenic family dog. This hardy all-purpose Irish breed of Terrier has a soft, luxurious golden coat. Bred for centuries in Ireland as hunting, herding and guardian dogs, they have become immensely popular in the United States thanks to their jolly personalities and their hypoallergenic coats. If they are brushed at least once a week, they shed very little and are one of the best dogs for kids with allergies. While Schnauzers may be a less obvious addition to our list, they are in fact low shedders who are an excellent choice for people with allergies! Because of their wiry coats, they don’t lose a lot of hair around the house, thus limiting the amount of dander that floats around in the air. Since they come in three different sizes (miniature, standard, and giant) it won’t be difficult to find one to suit every family! Like most hypoallergenic pets, Schnauzers should regularly be brushed (preferably by someone who isn’t allergic) which will help reduce any allergens. 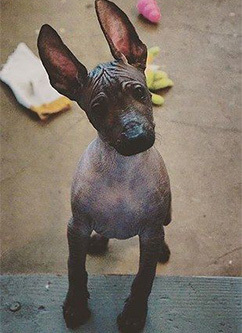 (Pronounced “zoh-loh-eets-KWEENT-le”) Also known as the Mexican Hairless dog, or more simply, the “Xolo,” these tiny bald dogs are a fantastic choice for allergy sufferers. Don’t let them long name deter you! Xoloitzcuintlis are intelligent and unique pets. And because they are hairless (except perhaps for a small tuft of hair on the top of their heads) this breed is an excellent choice. Like all hairless breeds, Xoloitzcuintli often require special skin care that may prove too intensive and time-consuming for some pet owners. 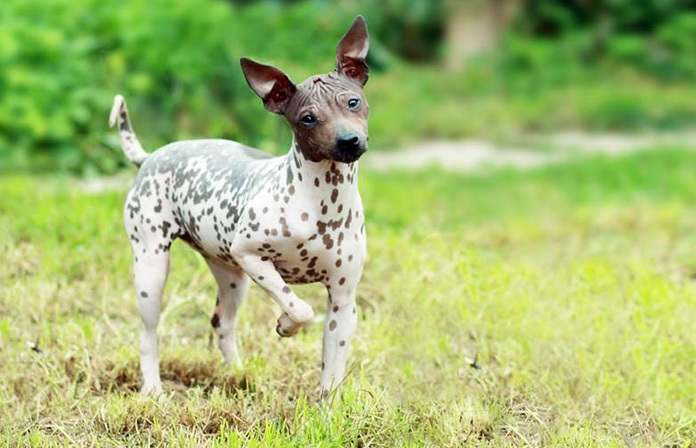 It’s also important to mention that Xoloitzcuintlis are a very particular breed of dog, however, as they have remained unchanged over centuries and still retain what can almost be called a “primitive” nature. They certainly aren’t for everyone! The Maltese are a French breed of small, white dog that has been gracing the laps of European royalty for hundreds of years. Loving, loyal, and very attached to their owners, Maltese are great for anyone suffering from allergies. They have a single layer of hair, similar to human hair, which grows steadily and doesn’t actually shed. While they may lose a little bit of hair when brushed, it’s unusual to find stray Maltese hairs around the house. Maltese require (and usually enjoy!) regular grooming. While many Maltese are groomed in fantastical and fancy ways for the show ring, most dog owners opt to cut their hair in what’s called a “puppy cut,” which leaves less maintenance and reduces the shedding even more. Due to their small size and delicate nature, the Maltese may not be the best breed for families with very young children. They love older kids, though! These wooly little dogs are one of the most recognizable breeds in the canine kingdom. Bedlington Terriers look like little lambs, and the texture and color of their coat are very much like a sheep! Because they shed so little, they leave less dander around the house (which is what irritates little noses and eyes and causes an allergic reaction!) Along with being practically hypoallergenic, Bedlington Terriers are affectionate, intelligent, and cheerful little dogs. They aren’t particularly popular in the United States, so be prepared to do a bit of research to find a breeder. Once you’ve identified your favorite breed for your family, there are many ways you can reduce allergens in your home and minimize the impact that a dog will have. There are a few important steps you can take to make sure the dog doesn’t cause an allergic reaction. If your child’s eyes water and you sneeze after petting or cuddling a dog, there is a good chance they’re allergic to dander. However, when deciding to bring a pet into your home, anecdotal evidence isn’t enough- you need to go to an allergist. Allergists can test for a variety of allergies very quickly, and they can give you definitive results almost immediately. They will likely test your child for many different common allergens such as mold, cigarette smoke, dogs, cats, dust, pollen, nuts, dairy, etc. While you may suspect that your child is allergic, the only way to know for sure is to bring them to an allergist and have a professional allergen test done. Not even hairless dogs can make your kid allergy free. Keeping fur well groomed and clean is a significant first step to reducing allergens in the home. Regular brushing and at least monthly bathing will go a long way. Every hair you brush is one hair you won’t find scattered around your house! Bathing is also essential, as puppies attract all sorts of debris, dust, and other outside allergies when taking their daily walks. Make sure to use a good dog shampoo (human grade shampoo can be too drying) and conditioner if you’re going to wash them frequently. If the pet’s skin dries out and gets flaky, that can make allergies worse, so there is often some trial and error involved when figuring out how often to bathe your pooch! If appropriate, trimming or shaving the fur regularly is another great way to reduce dander and shedding. 3. Air filters are your friends! Both HEPA filters, which usually require installation, and standalone units can make a big difference in the air quality of your home. Purchasing and then carefully maintaining an air filter will keep dust and allergens to a minimum, including those caused by your furry friend! It may sound obvious, but making sure to keep your home clean is another great way to reduce allergens. 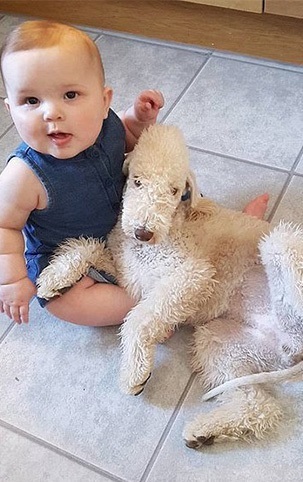 Even hypoallergenic breeds will leave some dander around the home, so vacuuming rugs, regularly washing textiles and curtains, and keeping bedding and couches clean and free of dog hair will reduce the effect on your child’s allergies. Some vacuums come with pet hair attachments, and most are pretty effective at removing all traces of fur. If your vacuum doesn’t have one, or if the fur gets embedded in the fabric, rubber gloves, a damp rag, and sticky rollers are other great alternatives. Despite our best intentions, our pets have a way of working their way into our hearts, and eventually our beds! Our four legged friends love nothing more than snuggling up with their humans for a restful nights sleep. Because they are pack animals, dogs are happiest when allowed to sleep with their “pack,” i.e. their beloved humans! While the jury is still out on whether or not co-sleeping with animals is generally a good idea (both for behavioral and health reasons) many, many owners give into those puppy eyes and invite the dog into bed. Limiting where your dog is allowed in the house is another great way to reduce allergens. Bedrooms and sleeping quarters are a good place to start. If the bedrooms are upstairs, train your puppy to stay on the ground floor (and get a baby gate to block off the staircase, at least initially!) 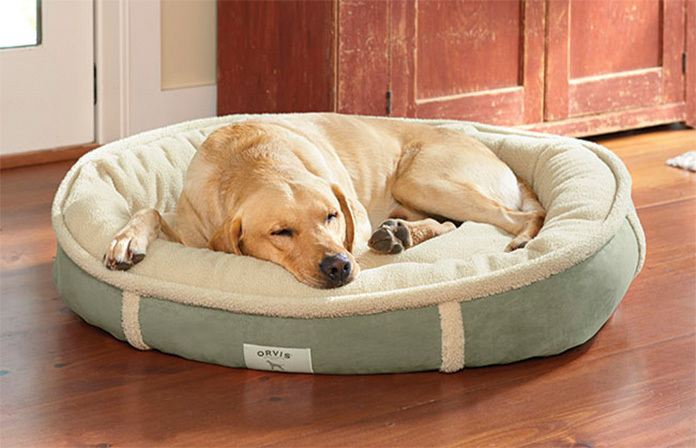 Carpeted areas and rooms with a lot of upholstery are other areas where you might not want to allow your pet to go. Once you establish the ground rules, most will comply. It’s important to remember that dogs are extremely social and intelligent creatures, however, and they will suffer if separated too much from their human family. As long as the dog is given plenty of attention and not isolated (check cages for dogs with separation anxiety), there is no reason why blocking off certain areas of the home to reduce allergies is a bad thing! Who doesn’t love a sloppy, wet smooch? Well, children with allergies probably won’t. Most people, including children, who are allergic to dog’s dander will most likely be to the saliva. Discourage licking from puppyhood, and keep the smooching to a minimum. Don’t let your allergic child touch the dog’s mouth, or handle their food or water bowls (which are often covered in saliva). There are many different treatments for allergies. While many children grow out of allergies as they get older, these types of situations are more frequent with food allergies. Many children who are allergic to dogs will stay allergic to them even into adulthood. If the child is only mildly allergic, medical treatment may seem like overkill, and it’s often advisable to try the above methods before resorting to treatment. It’s important to remember that you cannot “cure” a child of allergies. However, for children with moderate to severe allergies, there are treatments available that can limit their allergic reaction and allow them to live harmoniously with dogs. These are a popular option, though they require commitment and expense. The child will need to go to the allergist on a regular basis to receive these shots. There are two phases to immunotherapy treatment. The first is the “build up” phase, in which the child will receive injections frequently to build up their immunity. The length of this initial phase varies, but it can last anywhere from three to six months. After the “build up” phase comes to the “maintenance phase,” in which the child will need to go to the allergist once or twice a month to receive the injections. It’s important to take into consideration how cooperative your child will be- no kid likes getting shots! Though they may be begging for a dog, the prospect of bi-weekly injections may change their (and your!) mind. Allergy shots are frequently, but not always, covered by insurance. There are many over the counter medications that children can take to combat allergy symptoms. They are most commonly antihistamines. These drugs, which often come in two varieties (one for kids and one for adults), sometimes have mild side effects, such as drowsiness or hyperactivity. While many people take allergy medication for seasonal allergies, like pollen allergies that get worse during the warmer months, many people won’t want to give their children medication year round to treat pet allergies. Consult your pediatrician before committing to any medication regime, and think carefully about the potential side effects of any long term medication, even something as simple as allergy meds. Many children will eventually ask for a puppy. And who can blame them? Dogs bring joy, love, affection, and fun into the family and are a great source of unconditional love. If your kid has allergies, however, the fun will likely be short lived unless you take the proper precautions. Researching and choosing a good hypoallergenic dog breed, and keeping them clean is your first priority. Make sure air filters are installed and consider the possibility of medical treatment to combat allergies are all good ideas that may make it possible to bring a pup into a home.